Whilst in Essex, we took full advantage of the dry weather and explored as many scenic places as we could. Leigh-on-sea was one of them. Leigh-on-sea or 'Leigh' as it is fondly known is a coastal town built on the Thames Estuary off the North Sea. Leigh-on-sea once was a thriving fishing industry: providing fresh native oysters, rock oysters and various shellfish, namely whelks, winkles, prawns, cockles and mussels (good old fashioned East end fare!). Oh I hear a song coming on see link - Molly Malone. Not an English song, I know, but undeniably Old Leigh has Irish links. Every year, Leigh-on-Sea celebrates Leigh’s fishing industry and heritage, but today it was very quiet. Other than the odd fishing boat here and there, it was relatively quiet and cold. We decided not walk on the gravelly beach, as it was rather muddy and I didn't want to get my shoes mucky. So we decided to head back and walk the streets of Leigh instead. Just look at these charity finds. I purchased a Pyrex double boiler. 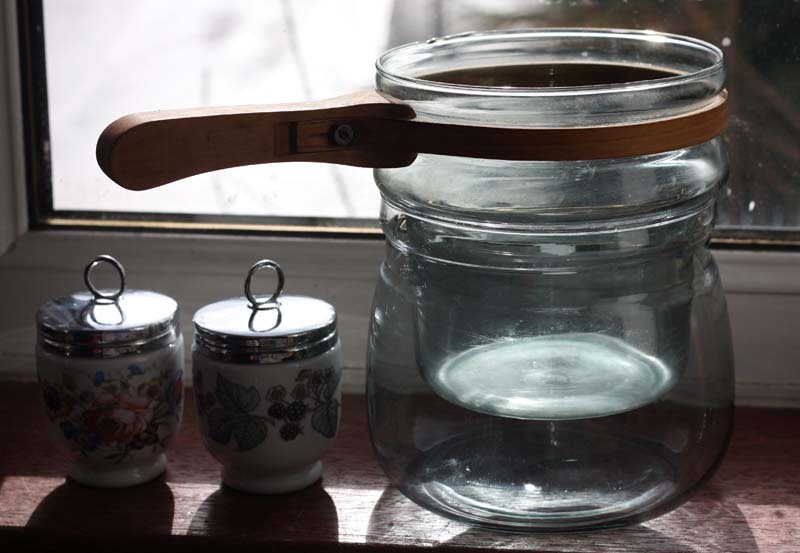 I was surprised first to see a double boiler made out of glass, secondly the wooden handles. When I got back home, I looked on the Internet and could not find a similar one. So you can imagine how chuffed I was at my find and at a bargain price of £2.95. My dear blogger friend Brenda fondly known as GardeningBren in Nova Scotia sent me an etsy link to a very similar looking Wooden handled Pyrex Double Boiler. If you follow the link, you will note that it has a lid. I knew the lid was missing from the one I purchased and wasn't so bothered by it, but I had not noted that the wooden handle was missing from the bottom one. I'm still rather pleased with it and will be extremely careful when I use it. I've just learned the reason behind why the handles were made from wood. Wood was used because the metal had to go to the war effort. This boiler was produced in 1941. There are also numbers and green markings at the bottom of each. 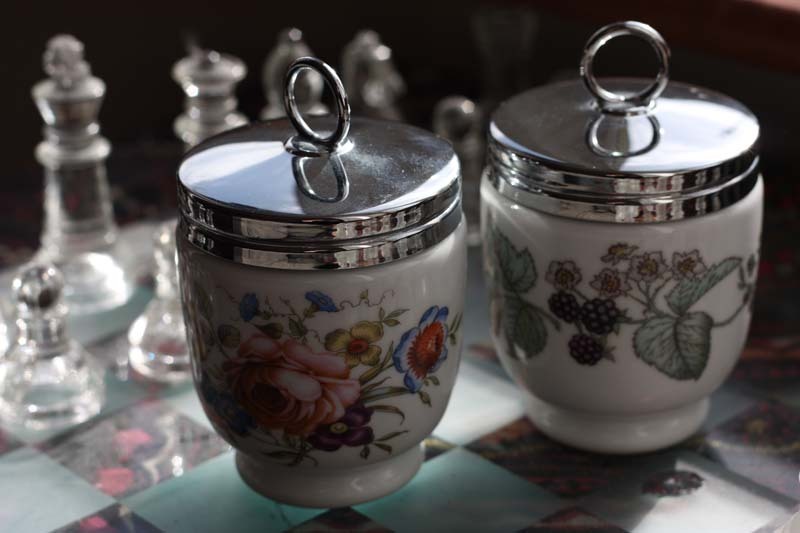 I also purchased two Royal Worcester porcelain egg coddlers with an easy screw top lid. Royal Worcester is Britain's oldest manufacturer of porcelain, and it was here, over a century ago, that the English tradition of Egg Coddlers began. The patterns on these two are called 'Bournemouth' and Lavinia'. Well how could I resist at a bargain price of £4.50 for the two of them. wish I'd known you were coming ~ we could have had a charity shop rummage together! Two very exceptional "new to you" acquisitions. The pyrex double boiler is an amazing find. You could check out this site that gives a bit of history and apparently, there should be some numbers etched in the pieces as well. I've never come across one of those double boiler things. What are they used for? Wowie... love that tart. Mango is my all time favourite, and this just looks so decadent and delish. Wow what brilliant charity shop finds! I had a charity shop fix in Pitlochry with my Mum, Sis and daughter and got a couple of gardening book bargains. My daughter bought a whole new wardrobe practically for under a tenner. So kind of you Chocolategirl64. On my part, it was an unplanned trip down. I'd love to have gone charity shop rummagign with you, except my husband may not have been entirely happy. We will be moving from Scotland down to either England or Wales, and the last thing he wants me to do is pick up more things. I'll keep my eyes and ears out for events happening in an around Essex, as I know I will be down that way again as that is where my mother in law resides. Once again, thanks for your warm invitation. Gardeningbren - you do amaze me and make me smile. Thank you. As soon as I've responded to comments, I will check out the link you've given me. Thank you for taking the time to find it for me. It is really appreciated. You may know double boiler by another name - Bain Marie - a stove top cooking pot used to cook delicate sauces such as beurre blanc or to melt chocolate, which is how I use it. It consists of an upper vessel containing the substance ie chocolate to be melted over the lower pot of water. When brought to a boil, the steam produced in the lower pot transfers heat to the upper pot and gently cooks the sauce or melts the chocolate. Thank you Michelle Peters - Jones. It was rather decadent to eat. One to make for celebrating. I really liked Pitlochry, but my visit there was really brief, so did not get the chance to rummage through the shops there. Its great to read that unwanted things are being given a new lease of life, you can't go wrong with - books. And a whole new wardrobe for under a tenner - your daughter must have felt spoiled. I know I would have. Thank you so much for thinking of me peasoupeats. It is very kind of you. I don't know the Essex coast at all. Sounds like you're having a good time. Your Pyrex double boiler sounds like a great find. Oooh, I didn't notice that tart first time around. It sounds superb and as I also have a can of mango puree lurking in my cupboards somewhere, I think I'm going to have to try this. I am learnign mroe about it as that is the part of the world that D comes from. I am really pleased with my Pyrex double boiler find - shame the handle is missing though. I love that double boiler mangocheeks - a real find I think. I have one of the egg coddlers! exactly the same as the one on the right - I bought it for my Mum when I was travelling in England many years ago. She loved it, and now I have it back again. I don't think either of us ever used it for egg coddling, just loved the look of it. So good to read that your mum, now you have a coddler. Shame your mother never used it, as it'd be asking you for soe recipes. I will have to use mine at some point, otherwise my husband will raise his eyebrows and forbid me from bringing home other finds - and I can't have that. Take care. What is an egg coddler though? There are two parts to an egg coddler. I should have pulled them apart in the photograph so you could see. The bottom of the device is a heat resistant cup, usually made from ceramic. The top is a snug fitting lid made from metal or ceramic, and the lid screws on so the water does not leak in. To use an egg coddler, you normally coat the inside with either oil or butter, crack an egg inside, and then submerge the coddler in boiled water for seven to eight minutes. The result is a very lightly cooked egg which is typically served in the egg coddler.You could also add flavourings like herbs or spices to enhance the egg.